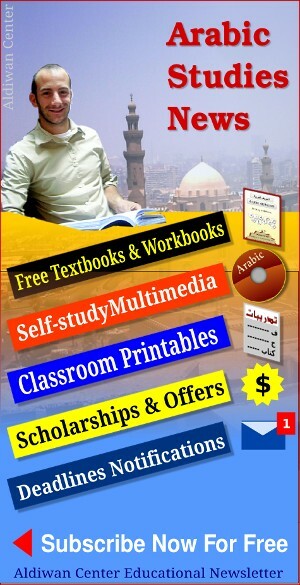 9-Monh Program is limited to one subject: Modern Standard Arabic (MSA/ Fuss-ha). Do not use this form unless all your questions have been answered, and you are ready to start studying – and travelling if you live abroad – to Aldiwan Center in Nasr City Cairo, Egypt. Please fill out all the fields in this registration form with accurate and complete data. incomplete forms may delay the processing of your registration. Read the General Aldiwan Cancellation Refund and Privacy Agreements page [link opens in new window]. Read about current programs and offers [link opens in new window]. The application form must be received before or on the appropriate program deadline. Registration is not complete without payment of the deposit. Upon arrival to Aldiwan Center Nasr City , the student will be asked to sign an agreement outlining the guidelines of studying at Aldiwan Center Nasr City. Aldiwan Center Nasr City will refund the deposit minus any wiring fees if the student canceled his/her registration 25 days or more before the program start date. Full refund minus $ 40 cancellation fee will be charged if the student canceled his/her registration 15 – 25 days before the program starting date. No refund is given to the student if he / she cancelled his / her registration 15 days or less before the program start date. Which of Aldiwan Center special services would you like to apply for? Which 9-Month Program are you applying for Required? How did you know about Aldiwan Center? Please make sure you pay $100 deposit as soon as you can so your registration and reservation be valid. We cannot accept you registration until your deposit is paid and received on time. The deposit will be deducted from the tuition fees. If you prefer to pay with wire transfer, transfer details will be sent to your confirmed email. I will pay with bank wire transfer, please send me wire information. I will pay in cash at Nasr City campus. I will pay later ASAP with another payment method. I read, and agree to the Payment, Cancellation, and Refund Policies of Aldiwan Center (required). I read, and agree to the general and privacy policies of Aldiwan Center (required). I agree to subscribe to Aldiwan Center newsletter (required).